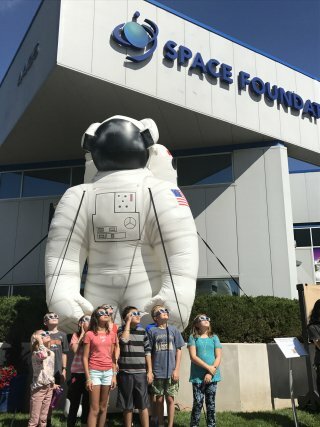 August 23, 2017 – An hour before the doors opened for the Space Foundation’s Solar Eclipse Party, people began to gather outside of the Discovery Center in Colorado Springs, eagerly awaiting the chance to score last-minute eclipse viewing glasses and to stake out the perfect spot to watch the once-in-a-lifetime solar eclipse. Less than an hour after opening, the Discovery Center was filled to capacity, and the line outside extended around the building. Indoors, guests created solar eclipse viewing tubes and watched live feeds of the eclipse from the West coast. Outdoors, visitors took turns at the filtered telescopes and lined up at the food trucks. A number of families brought their small children and various homemade viewers, constructed from cereal boxes and cardboard tubes. Soon the parking lot was full and traffic backed up along Arrowswest Drive. As the temperature began to drop and the sky dimmed, more than 1,000 people gathered on the Discovery Center grounds and watched the peak of the eclipse at 11:47 a.m. (Mountain Time). It was the perfect day for the eclipse, with ideal weather and a wonderful community of friends, family, space novices and enthusiasts.